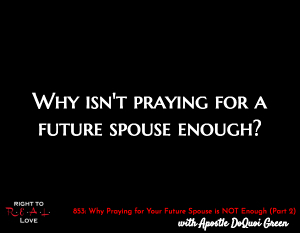 In this episode, Jay continues his discussion with spiritual warfare specialist Apostle DoQuoi Green by addressing the question: Why isn’t praying for a future spouse enough? Why isn’t praying for a future spouse enough? How satan tries to hinder our prayers. The impact of spiritual warfare on your marital destiny. Why you must persistently pray and engage in spiritual warfare. Reasons to avoid suppressing your desire for a future spouse. Apostle Green explains what it means to pray on the level of our promotion. Apostle Green shares why spiritual warfare is necessary for believers in Jesus Christ.